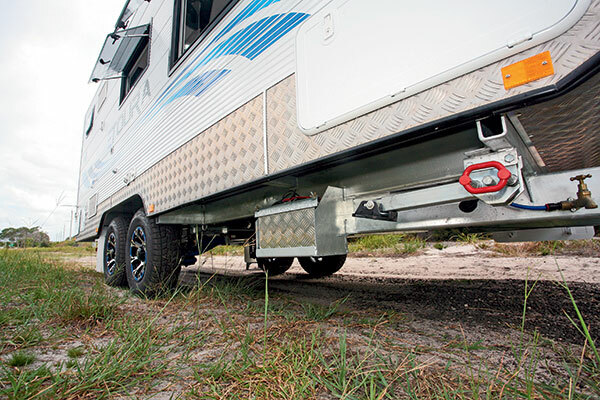 Although the Toura is a predominantly road-going van, Millard fitted Vehicle Components Cruisemaster Country Road Suspension (CRS) underneath. 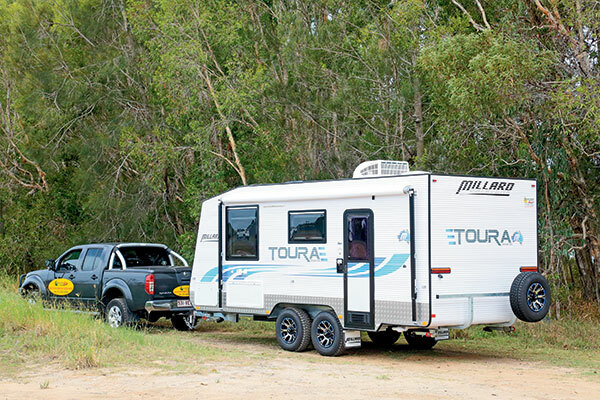 It’s designed as a lighter-duty setup than the fully offroad Cruisemaster XT and is purpose-built for bitumen and graded country roads. It comes with coil springs, shock absorbers and single trailing arm. 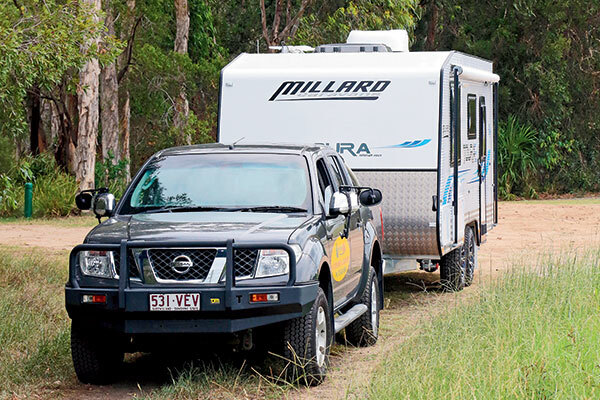 Millard likes to use Australian components where it can, so the hot-dipped galvanised chassis is built using 3mm Australian steel and the aluminium interlocked frame is clad in Australian-made aluminium that is rolled to Millard specifications. The most obvious feature of this van, upon first inspection, is that the ridges are very close together. Millard says that gives the cladding more strength and it is quite a distinctive look. Unlike the side and rear walls, the roof and front wall are made from one-piece fibreglass sheeting that is bonded to 3mm plywood, sandwich style. Alloy checkerplate protects the lower wall and the lower half of the front wall. Up front, the drawbar looks fairly plain but it has all the essentials like the ball coupling, handbrake, jockey wheel, mains/tank supplied tap and gas cylinders. There’s no front boot but the Toura has tunnel storage instead. And that is not particularly busy either – although it does hold the battery charger, the battery itself is mounted in a box fitted to the front offside chassis rail. At the rear, the spare wheel is mounted on a standard bumper bar. It’s set fairly high and, as with many caravan spare wheels, I have to wonder how travellers with back and hip problems lift them on and off. Under the Dometic awning, the wall-mounted picnic table has a 240V and 12V outlets, along with a TV antenna connection close by. A wall-mounted LED strip light gives effective night time illumination. Aussie Traveller supplied the security door and Mobicool the windows. Instead of full silicone sealing, Millard use a waterproof marine tape around the windows, one of the reasons being that it makes the window easier to remove in the event that repairs are needed. Stepping in through the rear entry door reveals a colour scheme of glossy white and grey, along with black upholstery. One of the benefits of glossy surfaces is that they are easy to keep clean. 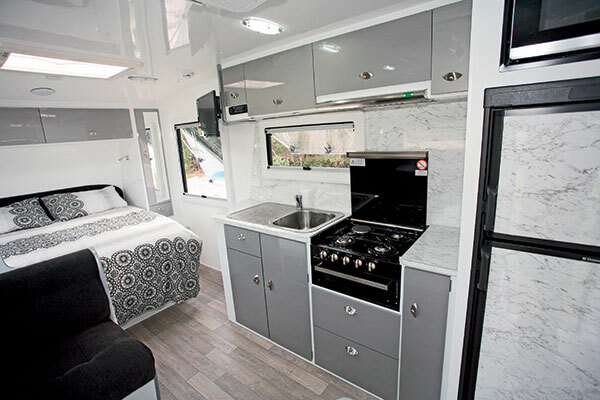 The Toura 1860 RD layout doesn’t deviate much from the industry standard front bedroom, rear bathroom layout with all the other essentials in between. Whipping up a meal in the Toura will be a breeze in the moderately sized kitchen. With the four-burner cooker and grill alongside the stainless steel sink/drainer there’s a nominal amount of benchtop area. On the storage front, there’s basically two of everything – cupboards, drawers and overhead lockers, along with a floor locker and a small end cupboard. Fitting into the space between the kitchen bench and the bathroom wall is the 186L, two-door fridge with microwave oven above. 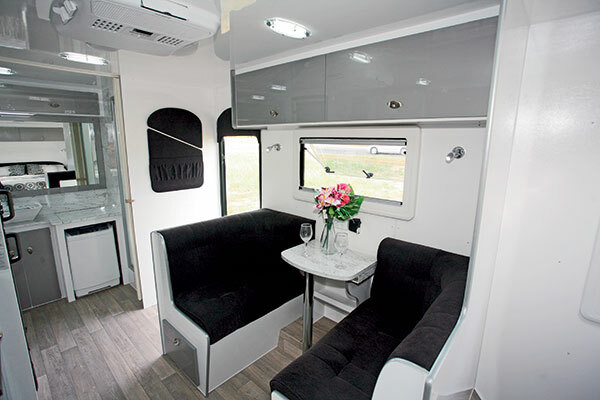 Opposite the kitchen bench, the café-style dinette will seat two people without too much trouble – foot space is slightly compromised by the wheel arch. In between the seats, the table will fold back if not being used. Above the seats, two overhead lockers offer plenty of storage space but like those above the kitchen, there are no extra shelves fitted. Between the dinette and the bedroom up front, there’s a full-height partition which, unless it is there for structural reasons, doesn’t do a lot. 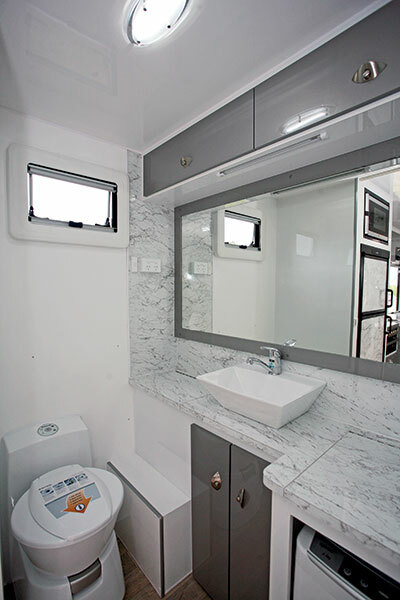 It’s really for convenience but, in the caravan industry, it seems to be almost law that the TV should be mounted on the end of the kitchen lockers. 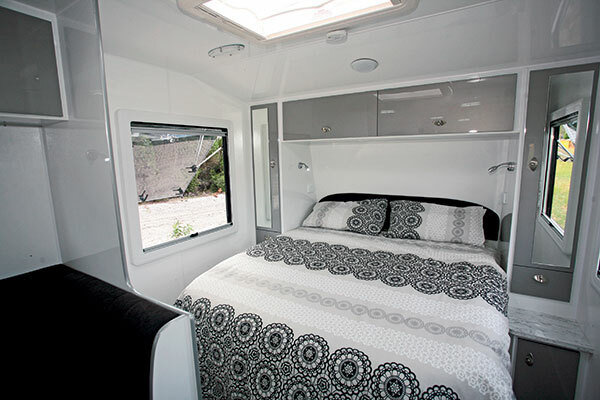 It certainly ticks all the boxes – right next to the power and antenna connections, out of the way and easily viewed from the bed or the dinette – although the person on the front side is going to be sitting sideways. The bed is a standard 1.85x1.53m (6ft 1in x 5ft) mattress on a posture slatted bed base, along with accompanying wardrobes and overhead lockers. There’s no front window but large ones on both sides give good ventilation. In the rear of the Toura, you get the full kit with a nearside shower cubicle, offside Thetford cassette toilet and a mid-wall vanity cabinet. Included in that is a top-loading washing machine and a large wall mirror. There is a hot water heater behind the cabinet but it does protrude into the toilet floor space. It’s not really an issue and it does give somewhere to park your book. Ventilation is handled by an exhaust fan over the shower and a small window above the loo. The Toura kicks in with a Tare of 2060kg and an ATM of 2660kg, which gives a much better than average load capacity of 600kg but would also allow, with careful loading, for the van to fit under the ‘Prado limit’ of 2500kg. I’d be getting a weighbridge check, though, just as a precaution. Behind the (few models old) Nissan Navara that I towed it with, the van handled without any trouble at all, even in the afternoon Sunshine Coast ‘peak hour’ traffic. Down the freeway, apart from the odd buffet by a passing truck, the van handled as it should. One of the assets of this van is that a large tow vehicle isn’t totally necessary and a mid-sized tow vehicle may suffice. 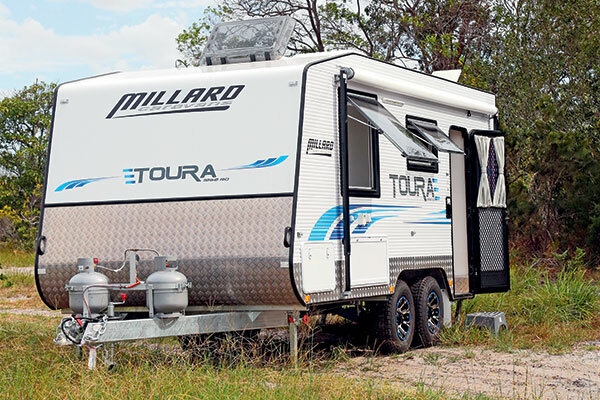 Its body length means a relatively comfortable interior and easy handling has been achieved and I think the Millard Toura is well named for touring on bitumen or gravel roads. The full review appears in Caravan World #562. Subscribe today for the latest caravan reviews and news every month!